Electrostatic is a branch of physics which deals with characteristics electric charges which are slow moving or stationary. In our childhood, we rubbed the scale on our head and try to attract paper from that scale. This is an example of Electrostatic Phenomenon. This depends upon the addition or removal of electrons from an atom. If there are more protons than electrons the atom is positively charge and if there are more electrons than protons than the atom is negatively charge. Line of Force: A theoretical line in a field of force, such that a tangent at any point gives the direction of the field at that point. 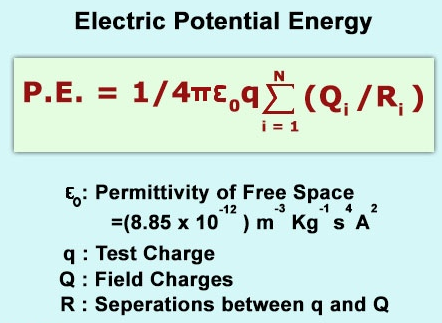 Inside a field, the amount of work need to move a unit positive charge from one initial point to any specified point without producing any acceleration is known as Electrostatic Potential (or also known as Electric Potential and Electric Field Potential). Usually the initial or starting point is Earth or a point which is at infinity. Electrostatic potential is denoted by V and it is a scalar quantity. Electrostatic potential can be measured in volts. The coulomb’s law of electrostatics is also known as Coulomb’s Inverse Square Law which describes the forces acting between the static electrically charged particles. First Law: The first law states of electrostatic state that ,like charges repel each other while unlike charges attract each other that is two positive charges will repel each other while one positive and one negative charge will attract each other. is directly proportional to the product of their strengths. is inversely proportional to the square of the distance between them. is inversely proportional to the absolute permittivity of the surrounding medium. This is known as Coulomb's Law. The rate at which electrostatic charge is changed with respect to displacement is known as Potential Gradient. 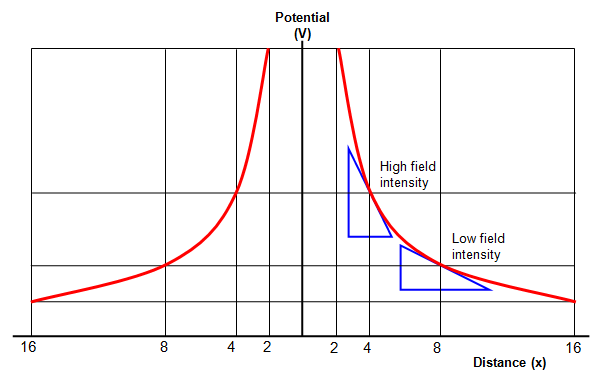 Electric field intensity is the negative of potential gradient at that point. 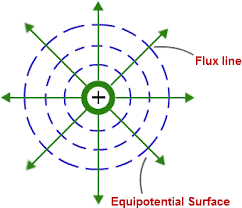 The surfaces which have equal electrostatic potential at each point are known as Equipotential Surfaces. The work done to move any charge from one place to other place on an equipotential surface is zero as all the points have same potential. The potential energy that results from conservative Coulomb forces and is associated with the configuration of a particular set of point charges within a defined system is known as Electric Potential Energy and is measured in joules. 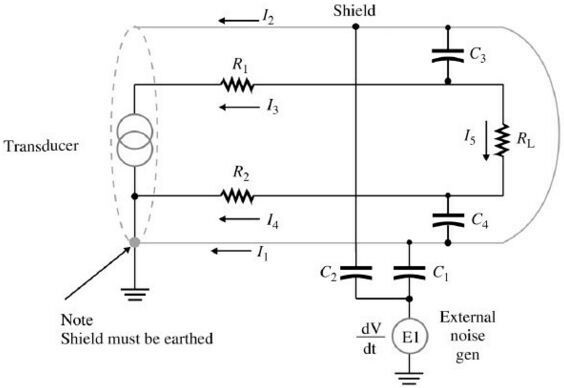 Electrostatic Shielding is the process of setting apart a certain region of space from external field. It is based on the fact that the electric field in conductor is zero. Capacitor also known as Condenser is two terminal electric components which has ability or capacity to store energy in the form of electric charge. The storing capacity of capacitance very from small storage to high storage. The ability of ancapacitor to store the energy in form of electric charge is known as Capacitance. In other words, capacitance can be described as the storing ability of an capacitor and it is measured in farads. For Example, if we connected a capacitor to a 9 volt battery and measured that it stored 9 coulombs of charge, its capacitance would be 1 farad. Capacitor C1 and C2 are connected in series. When the capacitors are connected serially than the total capacitance that is Ctotal is less any one of the capacitor’s capacitance. Electrical conductance of a conductor is defined as the capacity to store charge in it. Whenever charge is applied to an insulator its potential is raised to some certain level. Charge on a conductor and its electric potential are both directly proportional to each other. So, as we increase the charge electric potential also increases. 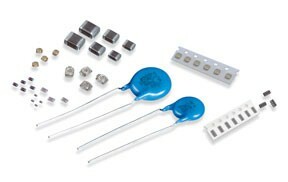 The setup of dielectric and electrode to form a capacitor is known as parallel plate capacitor. A is the common area of the two plates and d is the distance between the plates. Here, A is the common area of the two plates and d is the distance between the plates. Faraday have given this theory, that is if the space between two electrodes are filled with dielectric the capacitance of the capacitor will be increased. If all the space is filled by a dielectric that is there is no place left then the capacitance of a capacitor will be increased by K. and here K is known as Dielectric Constant. The total amount of energy per unit volume is known as Energy Density. Energy density is denoted by U. 1. A point charge q = - 8.0 × 10-9 C is placed at the origin. Calculate electric field at a point 2.0 m from the origin on the z-axis. To be found: E =? To determine: Energy required in (eV) = E =? 1. Find the energy density of a capacitor if its electric field, E = 5 V/m.